A new study shows that frequently eating red and processed meat can cause cancer in humans. Americans are reeling from the recent negative news about bacon, a long-time food favorite. 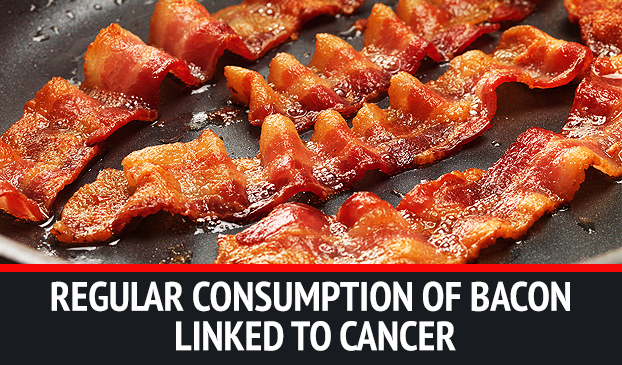 A World Health Organization report illustrates the link between the consumption of bacon and cancer, in addition to outlining the carcinogenic characteristics of other processed meats. Red and processed meat has been linked to bowel cancer, pancreatic cancer, prostate cancer and stomach cancer. The WHO’s International Agency for Research on Cancer (IARC) released a report that associates red and processed meat with cancer. The findings are included in a Q&A fact sheet. The information came after the WHO analyzed 800 observational studies that evaluated the amount of red meat consumed by different countries, ethnicities and diets. Red meat includes unprocessed meat such as beef, veal, pork and lamb. Processed meat includes muscle meat that has undergone salting, curing, fermentation, smoking, or other treatment. “People who eat a lot of these meats are at higher risk of bowel cancer than those who eat small amounts,” according to the NHS Choices website. Meat has also been linked to pancreatic cancer, prostate cancer and stomach cancer. However, there is one piece of good news for meat lovers. Beef, lamb and pork can actually be included in a healthy diet if consumption is limited. Red meat is a good source of protein, vitamins and minerals such as iron and zinc if eaten sparingly. Instead of cutting bacon out of your breakfast altogether, make sure you’re keeping track of how many pieces hit your plate. A few different ways to monitor your intake include switching to chicken or fish or only eating red meat on the weekend. Health professionals recommend limiting the intake of red and processed meat to reduce the risk of cancer. Bacon is now listed among cigarettes, alcohol and asbestos as a group one carcinogen. Evidence shows that processed meats are likely to cause bowel cancer, among other health problems. But if eating a hamburger is just as bad as smoking a cigarette, the meat industry is going to have a serious problem. There’s no doubt that sales will drop if the WHO labels processed meat as a carcinogenic substance. Betsy Booren, president of the North American Meat Institute, said that labeling red and processed meat as cancerous would cause problems throughout the meat industry that would take decades and billions of dollars to fix.